Can planting trees counter our carbon out-put ? Carbon, Air > Greenhouse Gases > How much carbon is human activity adding to the atmosphere? "How can we influence [this] if we have concern about the build-up of carbon in the atmosphere?" In this 2001 clip from “Variability of Northern Forests and Forestry--The Disturbing Influence of Climate,” Ecologist Dr. Mike Apps uses a flow chart to discuss sources and sinks of the global carbon cycle. When Dr. Apps refers to “carbon” during this clip, he means more specifically, the amount of carbon found in carbon dioxide1. His image uses arrows to show the amount of carbon released, carbon taken up, and carbon remaining in the atmosphere. There is an error on the slide, which Dr. Apps verbally corrects. The correct statement is that the amount of carbon emitted by fossil fuels is equal to burning all of Canada’s forests once a year or all of British Columbia’s forests twice a year. Since 2001, CO2 emissions from fossil fuel burning have continued to rise and, as of 2013, around 8.6 gigtons of carbon are now released per year. 1What percent of carbon dioxide is carbon? If you add up the atomic weight of carbon (12) and the atomic weight of oxygen as (16 x 2 ) you get 44, so the ratio of CO2 to C is 44/12 or 3.67. In other words 10 gigatons C = 36.7 gigatons CO2. In general, atmospheric scientists use gigatons of carbon when they talk about emissions, whereas the media and others often use gigatons of CO2--which gives a much higher number. In this clip, Dr. Apps is referring to gigatons of carbon. Amounts of carbon dioxide being released or taken up by different processes can be determined by using chemical equations and confirmed using field tests where CO2 concentrations are measured for a given area of forest or a specific industrial release. Dr. Apps is careful to differentiate between numbers that are well known and numbers that have a high degree of uncertainty. 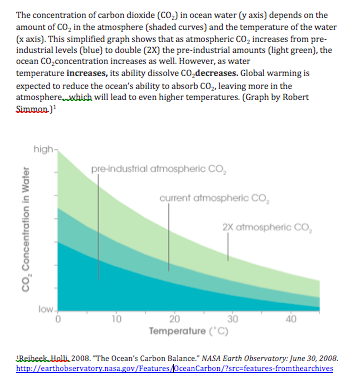 For example, he mentions that there is a great deal of uncertainty surrounding carbon dioxide uptake by the oceans, as shown in the accompanying graph. This uncertainty relates to the fact that the ability of a liquid to dissolve a gas and hold it in solution relates to water temperature, as well as water chemistry--both of which may change in future oceans. Dr. Apps compares data from multiple soueces and is careful to differentiate between fact and opinion. In science, it is critical to be clear when you are stating something you have drawn from data, such as "6 gigta tons of carbon is equivalent to burning all of Canada's forests once a year," and when you are stating something that is your opinion, "It is my opinion that we need to do something here and here." For example, another scientist may find Dr. App's data (the facts) to be accurate, but disagree that it would be difficult to increase the ocean as a carbon sink (the opinion). In this clip, Dr. Apps depicts that fossil fuel burning is adding more carbon dioxide to the atmosphere than is being taken out of the atmosphere through oceans and other carbon sinks, like forests. Scientific studies link the amount of carbon dioxide in the atmosphere with increases in global average temperature. Even a 3 degree Celsius increase in global temperature could lead to changes in our current Earth systems, impacting human society ecologically, socially, and economically. Studies such as Dr. App’s can help society to better understand the causes and preventions of a carbon dioxide increase so that decisions can be made about potential action. According to Dr. Apps, which numbers in the carbon budget are well-supported and which numbers are more uncertain? Can human carbon emissions be effectively countered solely by planting forests? In the atmosphere, where does the greatest amount of carbon (as contained in carbon dioxide) come from? Is the global carbon cycle currently balanced? In other words, does the amount of carbon (contained in carbon dioxide) released into the atmosphere each year equal the amount of carbon taken up from the atmosphere each year? What could be done to make it more balanced? This presentation took place in 2001. Atmospheric carbon from fossil fuel emissions was around 6.3 gigatons per year. Dr. Apps states that this is equivalent to burning all the forests in Canada once a year, or all the forests in British Columbia twice a year. As of 2012, fossil fuel carbon emissions (from CO2) have risen to around 8.6 gigatons per year. Estimate how many Canada forests would need to be planted to balance a year’s worth of carbon from current fossil fuel emissions in 2012. Investigate three ways of either decreasing carbon emissions or increasing carbon uptake. Discuss with a friend or colleague (or record in your science journal) which solutions seem practical to you and which you think are unrealistic. Materials: Notebook, paper, and pencil or dedicated computer file where you can keep your work. When carbon dioxide is taken up from the atmosphere, what happens to it (where does it go/how is it used)? Why do scientists think that fossil fuels are the main cause of the increase in atmospheric carbon dioxide? Select one or more of the questions above. Write down or sketch what you think answers the question based on your own understanding without looking anything up. Devise your own strategy for digging deeper (ask a scientist, check out university and government agency websites like NASA and NOAA, go to the library, design and conduct an experiment, etc.) until you're satisfied the answer makes sense to you. 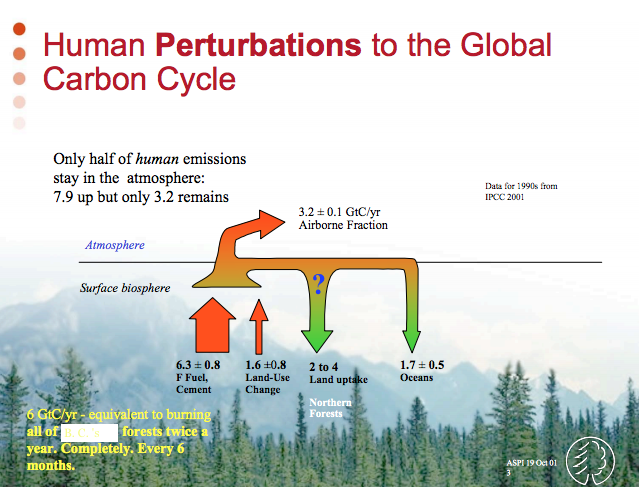 Using the numbers and arrows from Dr. Apps' chart (shown in the description), which of the following statements about the global carbon cycle is true? The amount of carbon (dioxide) taken up by the oceans is less than the amount of carbon released by land use change. Almost no carbon (dioxide) remains in the atmosphere after oceanic and plant uptake. The amount of carbon (dioxide) released through burning fossil fuels is greater than any of the other well-known fluxes. The amount of carbon (dioxide) released by land use change is greater than that released by burning fossil fuels. The complete PowerPoint from this presentation is available on the AGCI website. play Can planting trees counter our carbon out-put ?